“Bike Fest Tucson is an annual celebration of the most incredible form of human-powered transportation in the world – the bicycle! Clean and green, so simple, elegant, affordable and fun – the bicycle deserves an entire month dedicated to celebrating its beauty and practicality. 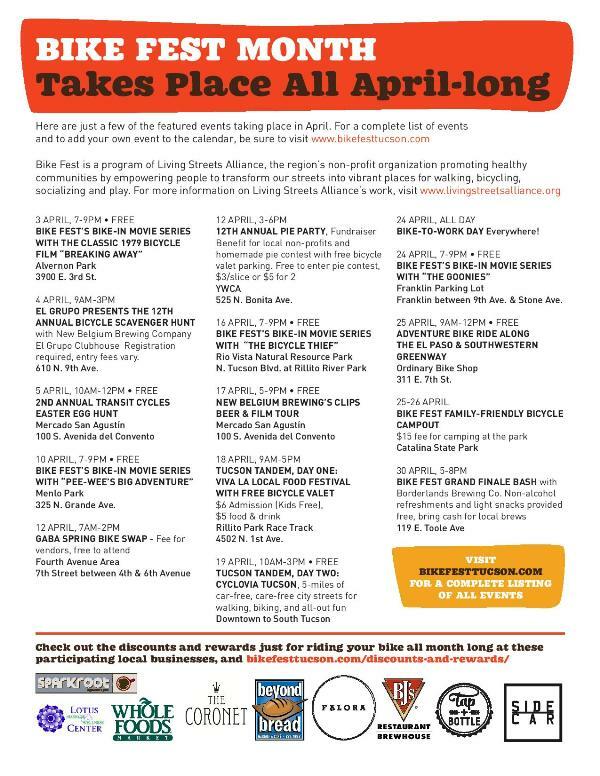 Get ready to spend the glorious, warm, sun-drenched days and cool nights of April riding your bicycle!” From www.bikefesttucson.com. Flyer below of some of the bike fest events. 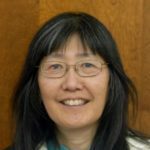 Next articleMollycoddling right wingers is insulting to them and does no favor to the rest of us. 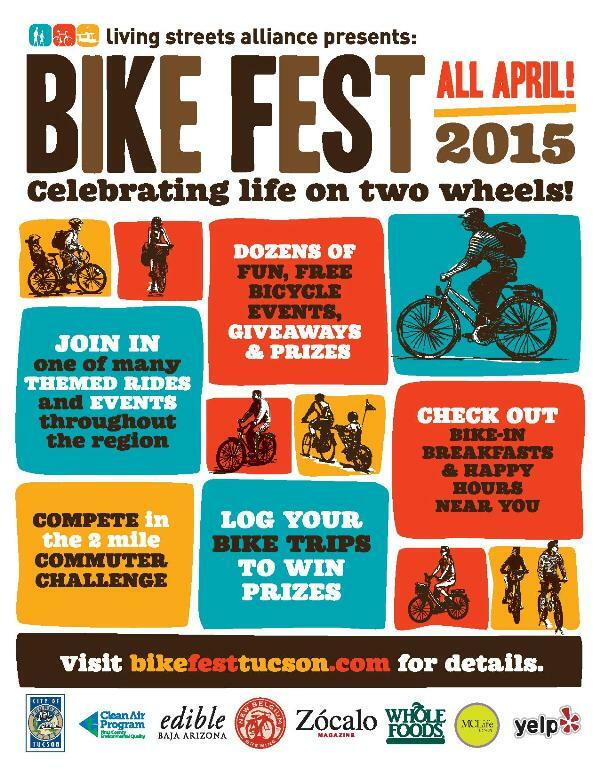 It’s still Bike Fest month in Tucson. About 50 people showed up to have breakfast with Mayor Jonathan Rothschild courtesy of Whole Foods on Speedway — breakfast burritos (egg/potato/sausage or vegan tofu), muffins, oranges, bananas, coffee, o.j., breakfast bars. Then at 7:45 we rode from there along the E. 3rd St. bike route, through the UA, Fourth Ave and then downtown for the grand opening ceremony of the new bike lane at E. Toole St./Stone Ave. More events till the finale of Bike Fest Tucson on Thursday. Go to the website for info. It’s Bike to Work week, with Food Stations & a free breakfast 7 to 9 a.m. at various locations around town. I (being self-employed) stopped by the one at E. 3rd St./Country Club this morning and ran into several friends biking by. (See photo on FB, if you’re a friend of mine). Otherwise, go to http://www.bikefesttucson.com for the rest of the locations through Friday. Watched a Bike In Movie night about bike touring in Holland, Germany, Turkey and within U.S. (C & O Canal, Katy trail in Missouri) at the Jacome Plaza in front of Joel D. Valdez main library on Saturday night. Two presenters Janet Miller and Bob Willman had biked each of these adventures either as a couple, alone, or with other bikers. Learned about touring on bikes, camping or staying at hotels, riding about 20 to 60 miles a day. Quite impressive journeys. About 15 people in attendance on the lawn at Jacome Plaza, same night as 2nd Saturday Downtown.